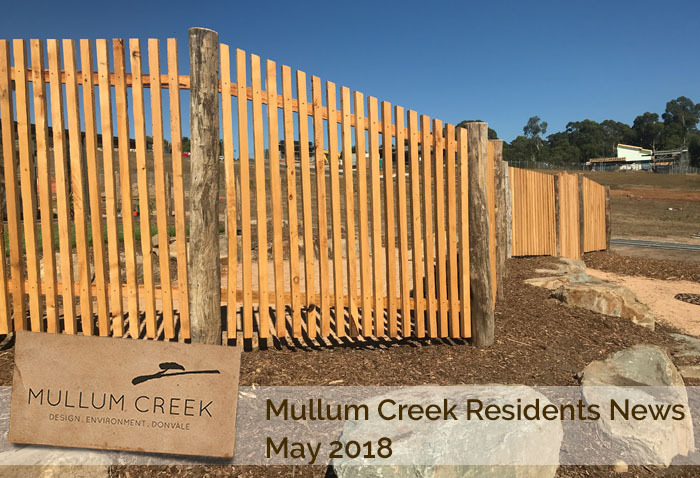 It has been a while since you’ve heard from us at the DRC, and a lot has been happening at Mullum Creek! There are now 10 new homes under construction in Stage 1 with another couple ready to go any day now. And of course the estate already has 4 permanent residents of the human variety (excluding the mob of kangaroos and the birds and other wildlife that make their home across the development). Over in Stage 2, civil works are also progressing apace (see update regarding timing below) and several prospective owners have their designs already DRC approved so that, as soon as settlement occurs, their planning permit applications can be lodged. Meanwhile, in the DRC, we are thrilled to welcome Jodi Rashbrook to the team. Jodi has valuable building and design experience as well as being truly invested in the core principles that underpin our Mullum Creek vision. Jodi is the co-founder of SCOOP Foundation Australia, a not-for-profit that supports schools in India and Cambodia and her other work is for the Alternative Technology Association, organising and running events such as Sustainable House Day and Speed Date a Sustainability Expert. If you’d like to get in contact with Jodi you can email her on jodi@haarchitecture.com.au. The practical completion of the landscaping and associated works of the public areas of Stage 1 at Mullum Creek means that Australian Ecosystems now move into the maintenance period of their contract with the developers. Please note that owners will be liable for damage caused to what is now Council owned property and assets (such as nature strip plantings) during the construction of homes at Mullum Creek. So we ask that you vigilantly supervise your builders during this period. Also a reminder that, in accordance with section 3.1(5) of the Section 173 agreement, development of your lot must commence within 2 years and be completed within four years of settlement if you are the first registered owner of the lot. If you are a subsequent owner of a lot, construction must be completed within 2 years of you becoming the registered owner of that lot unless otherwise agreed with the DRC. So if you haven’t started the design process, it might be time to put your thinking caps on! Verve, the Mullum Creek project managers, have advised us that the civil works for Stage 2 are expected to be completed in June 2018. Once authorities have signed off on services installed (telecommunications, electricity, gas, water, sewer and stormwater), titles can be issued and settlement of the lots can occur. We will keep you updated as these milestones occur. The DRC is noticing that some builders are gaining access to their sites via neighbouring lots. Please be aware that the permission of the neighbouring lot owner should be secured before this occurs. The DRC isn’t in a position to administer or police this aspect of your good neighbourly relationships! Residents at Lot 41, Danny and Liz, share their thoughts on designing, building and moving into their new home. Although there have been some setbacks and challenges along the way, such as longer than expected wait before settlement so that they could start building, Danny feels it ‘was worth the pain’. According to Danny, their beautiful house is the ‘best thing ever – it really is fantastic!’. Danny and Liz value the Mullum Creek vision and design requirements although they believe that meeting the requirements was costly. They are happy to be part of a project with such a strong focus on leaving a smaller footprint on the earth. Liz agrees that it is ‘important to maintain the values and strict environmental standards’ and that it is a good thing that the MC environmental requirements will be locked in to estate in perpetuity via covenants on land titles. They are very happy with their landscaping – the work of Australian Ecosystems who are also responsible for the beautiful landscaping of the public areas of the estate. Their garden will soon be home to 676 plants and 27 trees including avocado, lemon, cherry and nectarine. They will also be growing vegetables such as cucumbers, tomatoes and herbs. 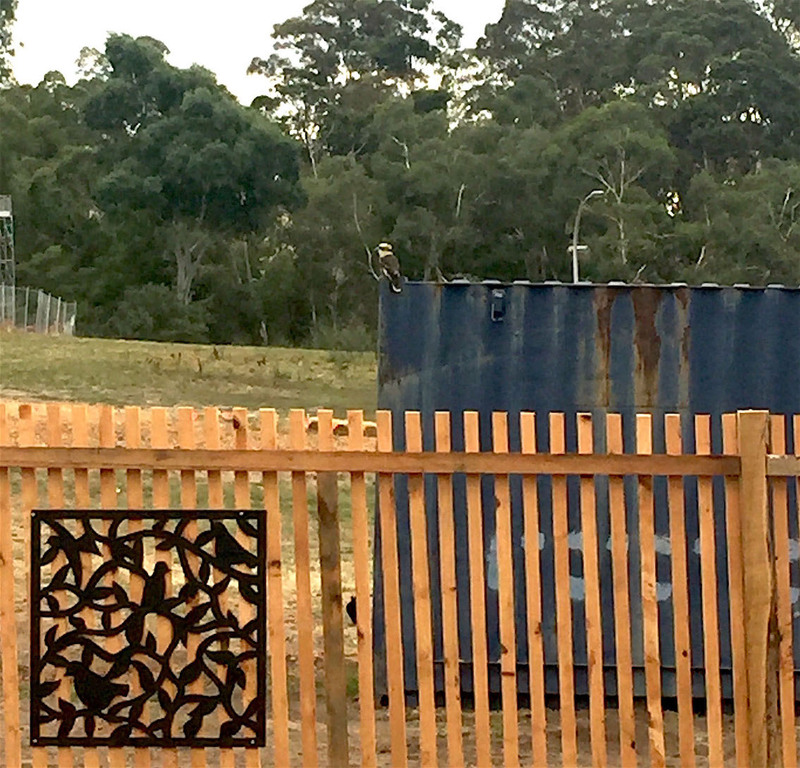 They really value the closeness of their new place to many species of birds, including ducks, parrots and kookaburras. Danny and Liz have a friendly kookaburra who has a habit of tapping at their window. He can be seen perching on their fence or on a shipping container nearby overlooking their garden. The view from the top of the hill, reached on one of their nearby walking routes, reminds Danny of Seymour, the Australian country town he first lived in after moving here from Poland. It is an uninterrupted natural view of the reserve which is full of wildlife. They are quite happy with the thermal performance of their new home and are excited to see how it will perform in the winter ahead! Toxic household chemicals, such as solvents, poisons, cleaning products, fertilisers and car care products can be safely disposed of for free at Sustainability Victoria’s Detox your Home events in Melbourne and across regional Victoria. Collected items are recovered and diverted from landfill. To find out more and register now for a suitable time slot to attend and drop off your unwanted items. Registrations are essential to avoid lengthy delays.